Here's a new home for your pets. It has 4 colour options and a poly count of 720. You may recolour as long as you link back to this thread and do not post the recolours on any paysite. PS. Just to let y'all know. 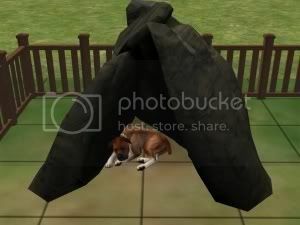 This object was created before the official release of SimPE for pets. This object was tested and I have not encountered any problems but if any should arise, please let me know in this thread. That's pretty cool....can you make a larger size one? A cave that human's can walk in? I love it Franky! Thanks for taking the time to create and upload it here! Franky I love it doll! It's very usefull for my Sims-Rock families. This will work well in my medieval hood, its been real hard using a modern type dog house in a time when dogs were pretty much wild.